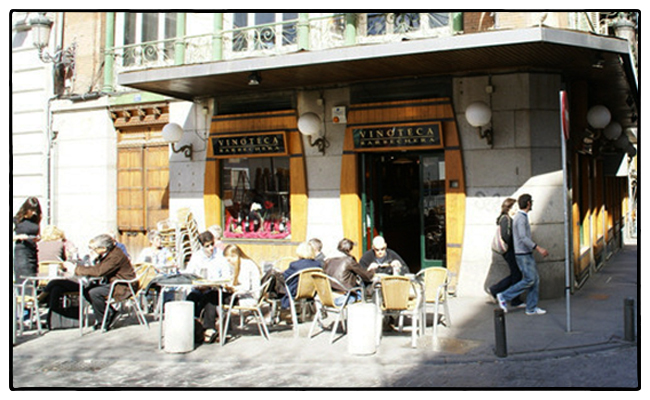 The Vinoteca Barbechera is a good wine bar for sampling the wines of Madrd. Wine has been produced on the plateau surrounding Madrid since the Reconquista. Christian conquerors planted vines as a sort of agrarian border, marking their progress as they gradually took the Iberian Peninsula back from the Muslim states of al-Andalus. Not all that long ago, the local stuff was sold from barrels, not bottles, and was ordered as either vino tinto or vino blanco. These days, you’ll find even the humblest tapas bar offering lovely bottles of Madrileño wine with a Vinos de Madrid DO label on the back. A good example is Vinoteca Barbechera, a classy little bar across from the Plaza Santa Ana, known for their pincho de solomillo and a great selection of local wines. The Grego Garnacha Centenaria, a refreshing red wine from Madrid, goes perfectly with the house specialty, a tender fillet of beef. Or order a glass of Cuatro Pasos, made from mencia, which tastes very fresh and fruity – almost like a Beaujolais – with roasted apple and foie gras on crisp toast. When it’s time to pick up a few bottles to take home with you, two of the best wine stores in Madrid are Lavinia and Bodegas de Santa Cecilia. Lavinia is organized like a library, with knowledgeable clerks happy to help you find everything from an expensive Ribera del Duero to a bargain-priced vino de Madrid. Look for Rincón, a syrah-garnacha blend that has a lovely hint of vanilla on the nose. If you’re having trouble making up your mind, there’s an elegant wine bar upstairs for sampling by the glass. Most Madrid bodegas aren’t open to the public, but there are a few exceptions. The most welcoming is Qubél, half-an-hour south of Madrid in Pozuelo del Rey, where owner Carlos Gosálbez, a former pilot for Iberia who speaks excellent French and English, is happy to pour you his organic blends of tempranillo, cabernet sauvignon and syrah. Also worth a visit is Cuevas del Real Cortijo de San Isidro, a historic winery near Aranjuez, founded by Carlos III in 1782. Their Madrileño wine, Homet, which is mostly tempranillo with a bit of cabernet sauvignon, merlot and syrah mixed in, can be sampled in their recently refurbished visitor centre. Bodegas de Santa Cecilia, Blasco de Garay, 74, 34-91-445-5283. Cuevas del Real Cortijo de San Isidro, Cortijo de San Isidro, Aranjuez, 34-91-535-7735. Lavinia, Calle de José Ortega y Gasset, 16, 34-91-426-0604. Qubél, Calle Valparaiso, 9, Pozuelo del Rey, 34-91-872-5804. Is Lavinia the place you step down from the street into a very modern, two-story store. It has a restaurant on the mezzanie level? That’s the place. And it’s a very nice restaurant. Had lunch there.